Require very little care and maintenance. An undemanding plant for filling spaces. Helleborus orientalis are not from the exotic Orient. In fact they are native to areas of Turkey and Greece which may explain their tough constitution. They are often called winter roses, presumably because they flower in winter and are easy to grow. Their link to roses is as remote as their link to the Orient. They are an enormously obliging and gently understated plant, with pretty cup flowers which face downwards. These are not plants for deep shade – keep them to the margins of bush or woodland or even the open because they need reasonable light levels and can cope with full sun. Easy-care plant and leave specimens, they don’t appreciate being lifted and divided but are happy to be left to their own devices with the occasional feed. There has been an explosion of different hellebore cultivars on the market in recent years, many of them orientalis hybrids. Some of the frilly doubles are very pretty, some are just average doubles. The really good dark maroon and slate colours will be better if you live inland and can give colder conditions. The simplest seedling forms are just single flowers in shades of pink, white and green, with or without freckles on the inside. Floating blooms in a glass bowl is the usual method of displaying them once cut. Helleborus orientalis sets seed freely but the seed will not come true to its parent and you will get considerable variation. Push hoe or weed out surplus germinating seed to prevent too much competition. Aphids can make the spent flower head their home so it is often advisable to deadhead once at the end of the flowering season in spring. We cut off all the old foliage in mid autumn which gets rid of any lingering aphids and also exposes the pretty flowers to view before the fresh foliage appears. This entry was posted in Plant collector and tagged Abbie Jury, Helleborus orientalis, Tikorangi: The Jury garden, tried and true plants, winter roses on 5 January 2011 by Abbie Jury. •	The easiest lachenalia to grow. •	Widely available, from many other gardeners if not from every garden centre. •	Often sold as Lachenalia Pearsonii. In the gloom of winter when the main colour comes from pink camellias, the early flowering lachenalias ring a colour change to orange and red. Whether you consider this form of aloides to be garish or cheerful depends on your personal taste. It is the most common lachenalia in New Zealand and is often referred to as Pearsonii. It has two strappy leaves per bulb, usually with burgundy spots. These are South African bulbs which thrive in areas which have winter rainfall although even the toughest aloides will not want to be out in hard frosts. Lachenalias have a long dormancy period so are easy to lift and divide. Try underplanting citrus trees to repeat the colour, or we find it also combines well with the green, mounding hillocks of our native scleranthus biflorus. It will combine equally well with any predominantly green scene to add a bright spot. This entry was posted in Plant collector and tagged Abbie Jury, Lachenalia aloides, Taranaki gardens, Tikorangi: The Jury garden, tried and true plants on 5 November 2010 by Abbie Jury. The hardiest of the vireya family. Tidy, compact growth around 75cm high. Flower freely over a long period of time. Siblings, these three cultivars. The breeder, Os Blumhardt, gave us seed of the cross and one plant grew so well we put it into production with his agreement. We called it Jiminy Cricket because the flowers are held upright and as singles, reminding one of the original Jiminy Cricket’s eyes swivelling on stalks. The remaining plants with Os also grew well and in due course another nursery took two and named them Saxon Glow and Saxon Blush. Glow is a little redder, Blush is a little paler pink while Jiminy is more coral orange coloured but they all have similar habits of growth. They are funny dense little plants with stiff, upwardly pointed leaves. And hardiness in colder, wetter conditions where most vireyas would promptly curl up and die – that is their biggest attraction of all. This is not to say that they will take bog, repeated heavy frosts or snow. They are just hardier than any other vireya we know so are a good choice for very marginal conditions. They make a corker little hedge – we have a semi circle planted beneath a mandarin tree and after close to a decade, they are still bushy and only about 60cm high. Vireyas are easy to strike from cutting so patient gardeners may just buy one plant and build up the numbers for a hedge. This entry was posted in Plant collector and tagged Abbie Jury, Jiminy Cricket, Saxon Blush, Saxon Glow, tried and true plants, vireya rhododendrons on 26 August 2010 by Abbie Jury. Grows like a natural bonsai. Flowers in late autumn and winter. Widely available and dead easy to increase at home. Optimistically called the Money Plant sometimes. Apparently good for feng shui. This crassula comes from a very large family and has undergone a number of name changes – the current choice seems to Crassula ovata. But it is commonly known as the Jade Plant. In near frost free areas, it is fine as a garden plant but inland, it will need some protection. The dry border under the eaves of the house may be an option, or a container brought under some cover in winter. Frosts will destroy the flowers and can burn the fleshy leaves, even kill the whole plant in bad cases. Being succulent, it doesn’t want wet feet, either. In return, the crassula will reward you by being genuinely easy care and undemanding and putting on a very pretty floral display in the gloom of early winter. I have never seen it more than 90cm high but it develops into a naturally characterful, gnarly looking plant with relative speed. To get more plants, just cut a branch off. Let it dry for a few days and then stick it in some potting mix or good garden soil. Bingo, it will grow roots, just as long as you don’t let it get too wet in the meantime or it may rot. This is a good plant for children to try growing – get them to put in cuttings now and the plants should be well established as Christmas presents for grandparents. Be generous and put in larger cuttings, whole branches even, for more impressive results. This entry was posted in Plant collector and tagged Crassula ovata, Jade Plant, tried and true plants on 26 August 2010 by Abbie Jury. •Flower from mid to late autumn when few other perennials flower. •	Fill a large space in the garden. •	Many of the best new varieties available here have been bred in New Zealand by our own expert, Dr Keith Hammett. •Deciduous, so the foliage dies away completely over winter and returns afresh. •	Easy to grow in good conditions which don’t get too dry over summer. You do need space for these late autumn beauties and they will be badly affected by heavy frosts. But if you have a suitable position, they are an easy-care delight. These two varieties are both from the breeder, Keith Hammett and alas we no longer have the names. The big, floppy pastel lilac is so pretty against our shed and I thought at first I was looking at a clematis from afar (it is about 2 metres tall). The golden orange sunburst bloom (love the slightly twisted petals) is a little more compact (a little shy of two metres) and has delighted us for a number of years, planted as it is by the mandarin tree whose fruit are colouring to match. They are not called tree dahlias because they grow up like a tree but rather because they grow much larger than the usual type of perennial dahlias. In windy conditions they need a bit of support – some of ours we fence in with heavy duty bamboo cross bars. Otherwise, they are like any other dahlia with typical hollow stems and dahlia leaves, growing in a large clump from tubers below ground. Most tree dahlias come from D. imperialis which is native to Columbia and Guatemala which explains why they are not keen on cold and frosty conditions. This entry was posted in Plant collector and tagged tree dahlias, tried and true plants on 13 August 2010 by Abbie Jury. • Widely available in garden centres. • Evergreen and generally hardy. • Interesting range of colours and foliage markings. Heucheras have gone through something resembling a makeover in recent years, thanks mainly to American plant breeders, and are now a stock line in every garden centre. I have never heard them go under a common name in this country, but they are the clumping perennials with frilly, maple-shaped leaves often with mottled or frosted markings. They do flower but the tiny blooms are secondary to the wonderful foliage. 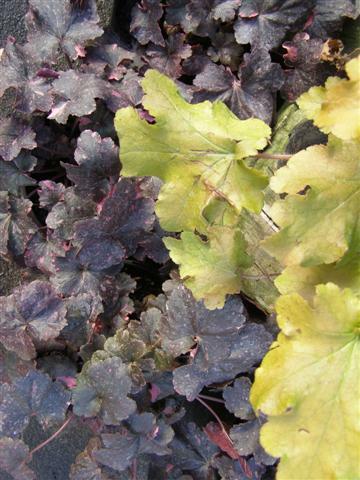 Being native to North America, heucheras are reasonably hardy, even though they are evergreen. It was the lovely burgundy and purple shades which made most of us take notice of this plant genus here. Since then there have been a range of amber, gold and almost ginger shades as well and there is a lovely little lime green. It took me a while to learn how to grow heucheras successfully. It was a little irritating to admire them in other people’s gardens and to have their owners smile smugly and say that they had no difficulty with them, all the while seeing my own plants get smaller, not larger. The secret, which they did not tell me at the time, is that heucheras are not a perennial that you can plant and leave for years. They thrive on being lifted and divided regularly (late winter to early spring is the best time for this) and replanted in well cultivated soil with plenty of humus added. I also find they do better in a colder, open area of the garden where they get plenty of light but they are not baked in the summer sun. In good conditions, the divisions reward you by making satisfyingly big clumps within the season with foliage which keeps its colour well and is generally untroubled by pests and diseases. 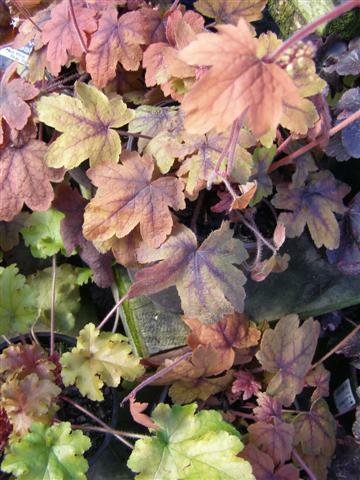 This entry was posted in Plant collector and tagged growing heucheras, tried and true plants on 23 July 2010 by Abbie Jury.